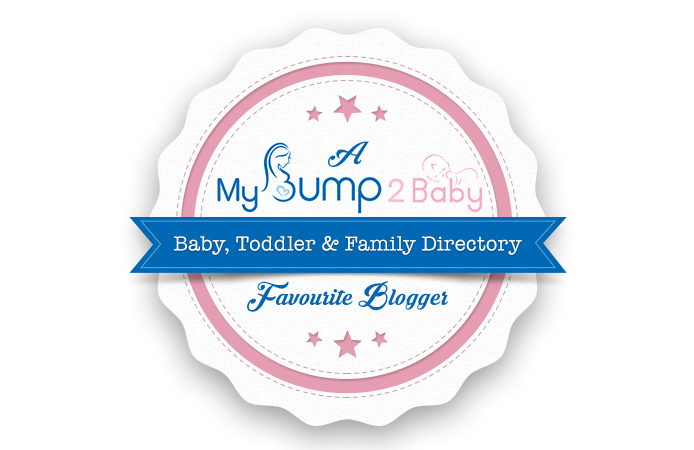 Disclosure: This post includes a gifted product sent to us for review. All opinions are our own. 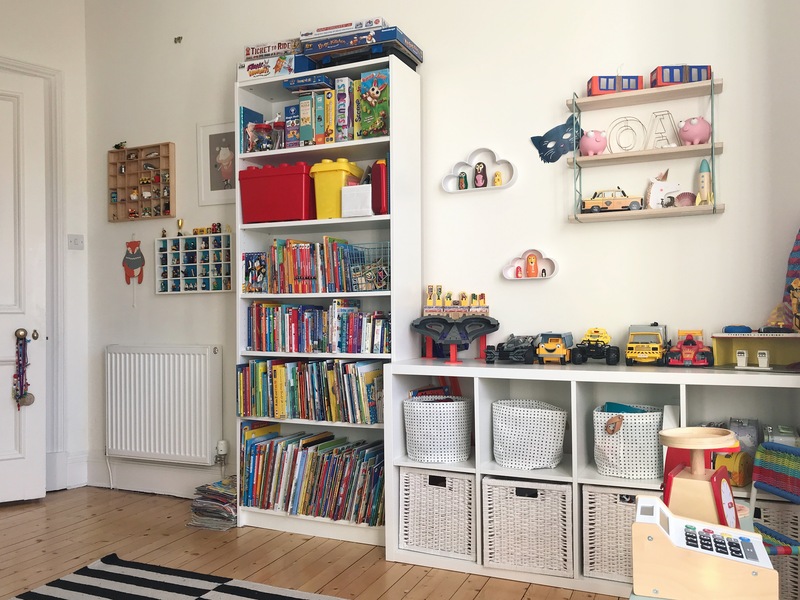 Ever since we moved house last Summer, people have been asking me to share a tour of the boys’ new room, which I have posted glimpses of over on Instagram. 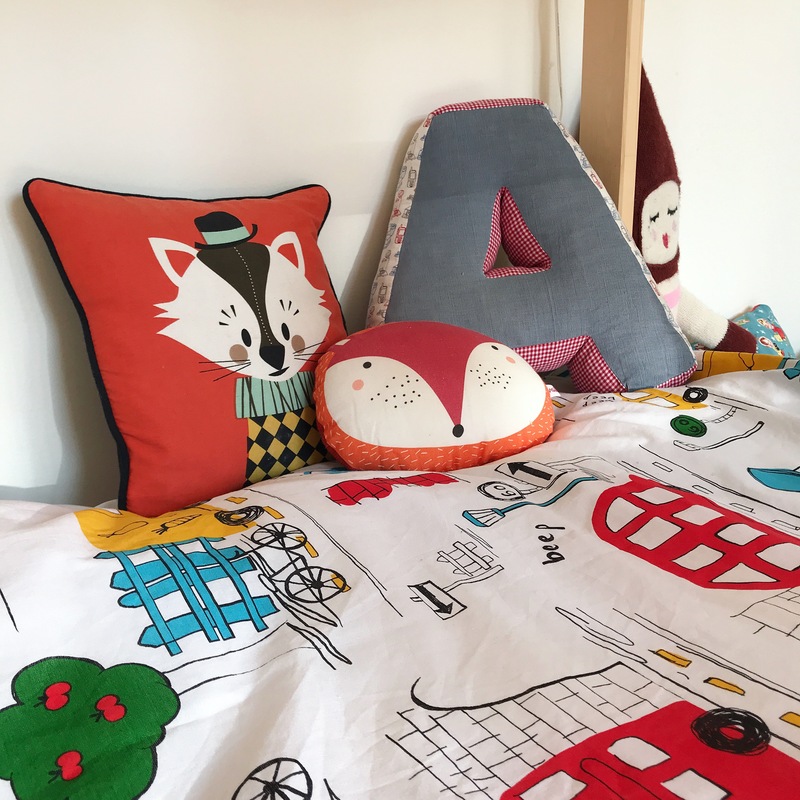 So when Room to Grow invited us to review one of their duvet sets, I thought this was the perfect opportunity to finally get that room in order and photographed. And they even very kindly sent us two sets, one for each boy! 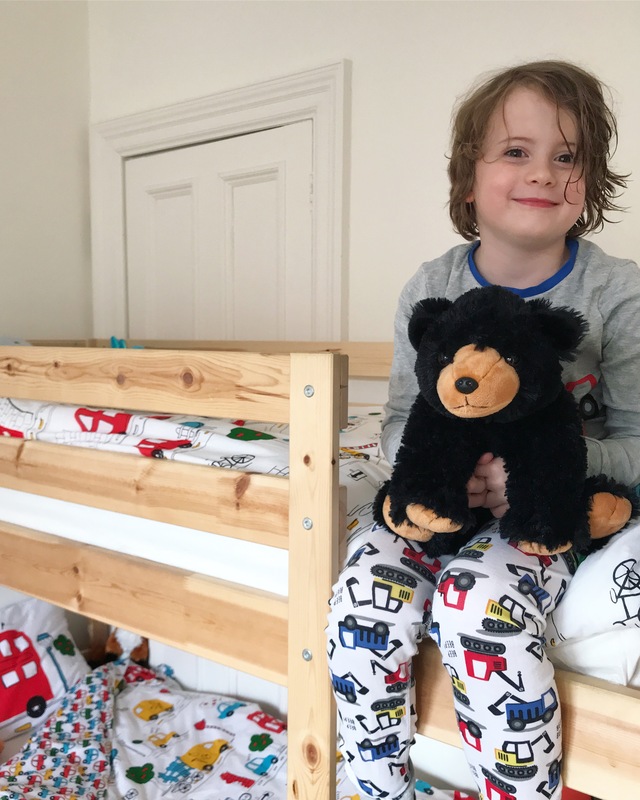 In our last place, the boys had two shared rooms between them – a smaller bedroom and a larger playroom – but since we moved from a three bedroom to a two bedroom apartment that’s about a third smaller than before, we’ve had to squeeze all their stuff in to one room. 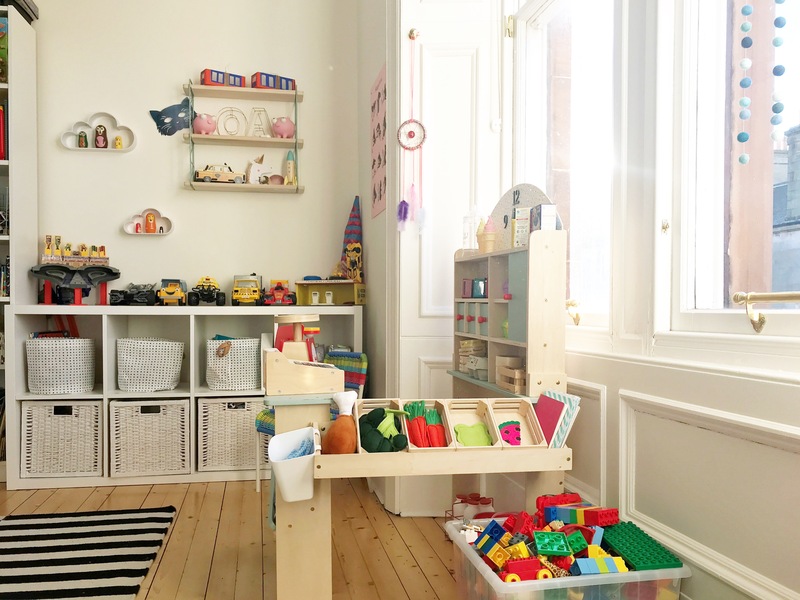 The eagle-eyed among you, who remember the boys’ old playroom from pics on Instagram and our feature on Design Mom, may be asking themselves what happened to their play kitchen and their tee-pee? 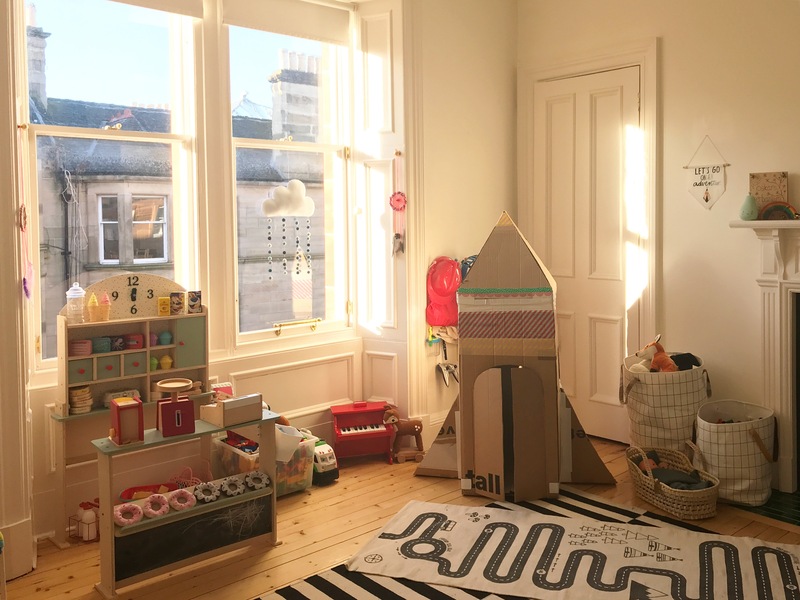 Fear not, the tee-pee found a home in the living room, and the play kitchen sits in our actual kitchen, so we can now cook side by side! Another thing we had to contend with, other than having less space, is the lack of wall space. With a two doors, a large double window, a fireplace, and a built in cupboard, that didn’t leave us much wall space for furniture. 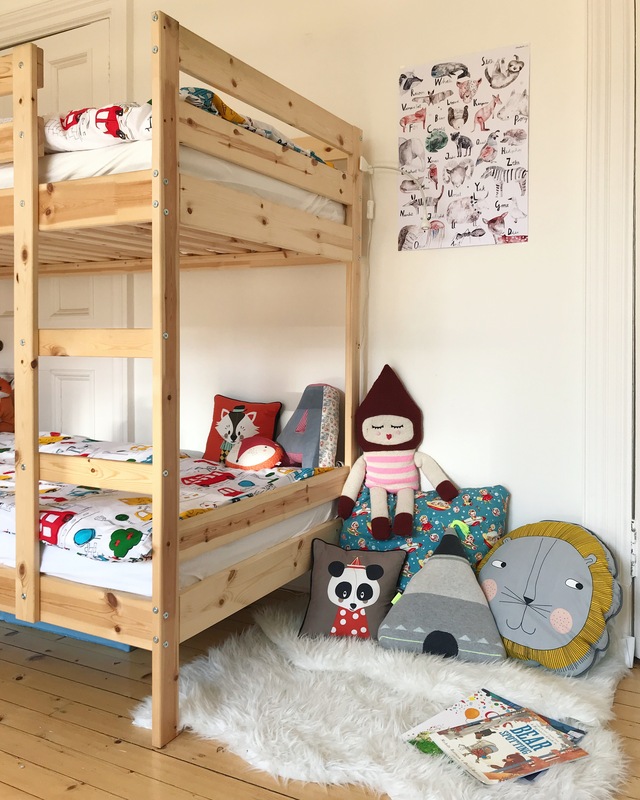 Apart from the hand made items (their grocery play store and the aforementioned kitchen and teepee), we had actually left all of the boy’s furniture behind in Berlin so we were able to start from scratch. The biggest decisions was where to put the bed. 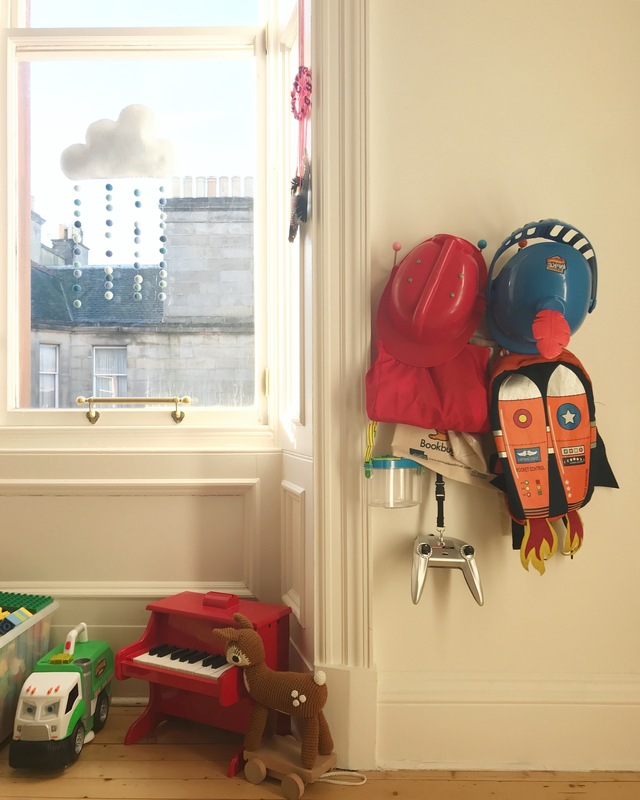 The door to the right of the fireplace actually lead to a boxroom (as larger storage rooms in Edinburgh tend to be called), which can also be access via a door from the hall. So we decided to close off that door and put the bed in front of it. 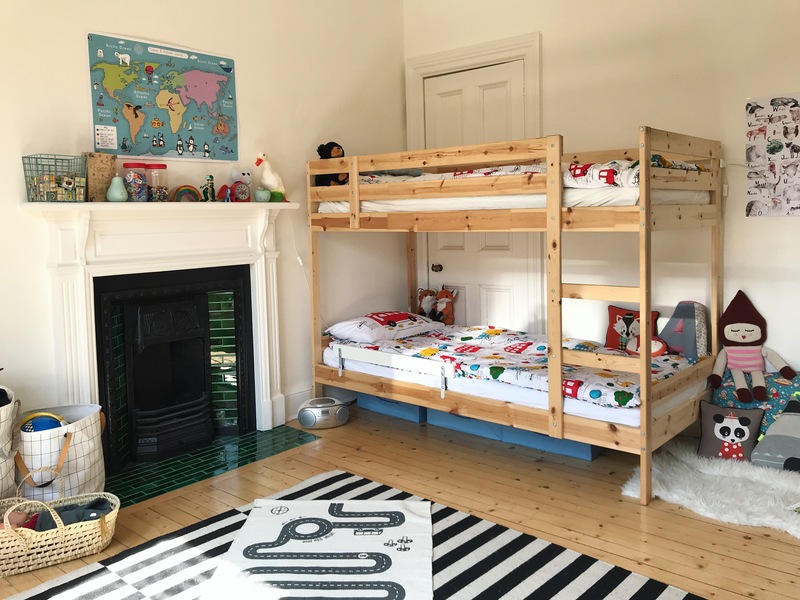 The door doesn’t lock, so having the bed there means the kids can’t open it! The door to the left of the fireplace is a built in cupboard, or a ‘press’ as we call them here. 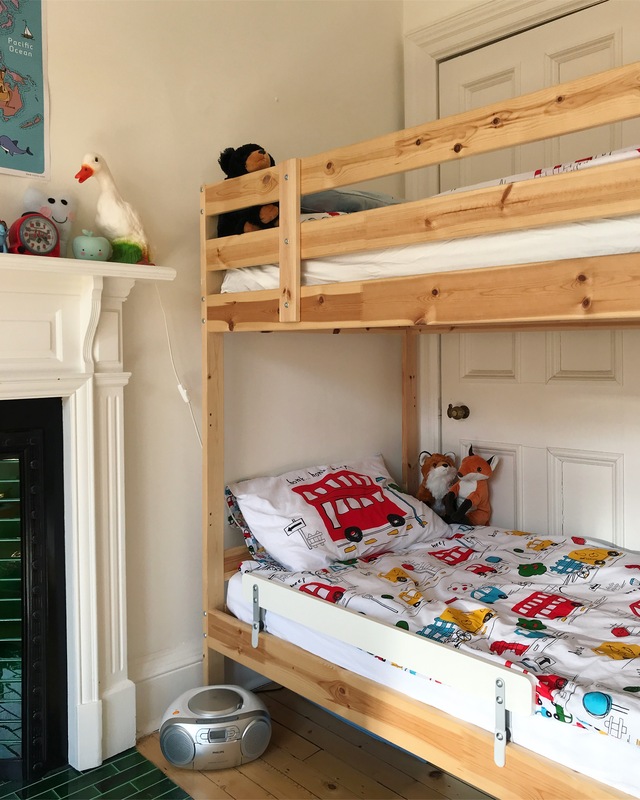 It’s smaller than their two previous wardrobes combined, so what we did was to get them a new bed that had space underneath for storage, and then swap the seasonal clothes around. 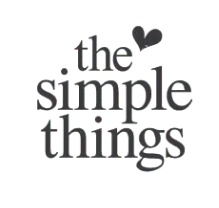 That way, the clothes that are in use all fit in the wardrobe and the seasonal clothes get stored under the bed. Another of the under bed storage box holds their spare bed linen. The cupboard actually just had one shelf and a hanging rail in it when we moved in, so we put in a narrow chest of drawers at the bottom and added in more shelves. I don’t bother ironing or folding their clothes, it never lasts more than 5 mins anyway, so I just go a load of boxes for each of them to throw their stuff in – one for tops, one for bottoms, one for underwear etc. 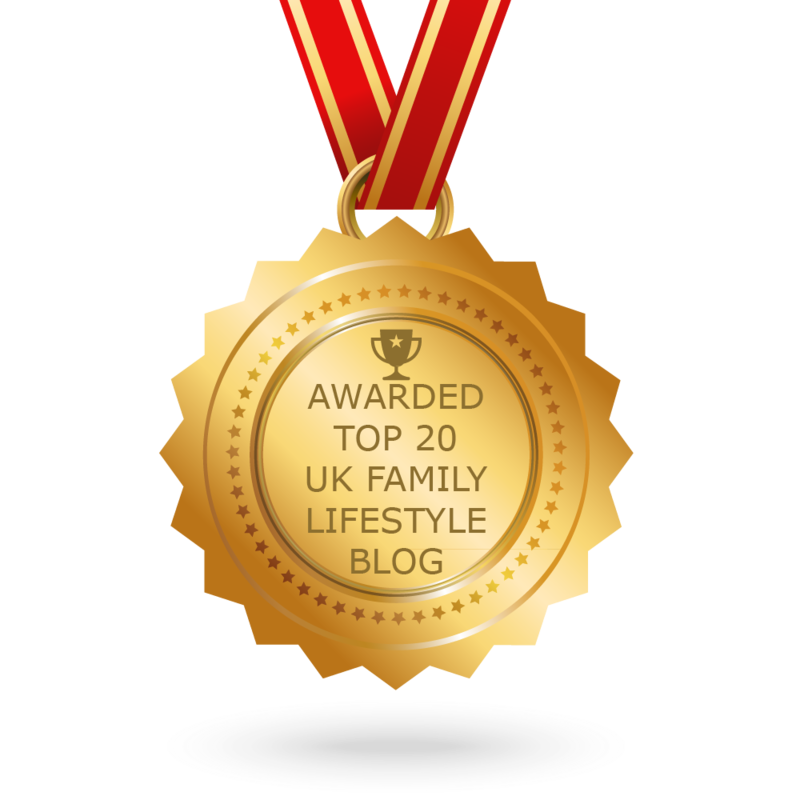 At the moment, we have Oskar’s things near the bottom as he dresses himself, but now Mr Fox is getting old enough to start dressing himself too so long term we may have to look at a different solution, as neither of them are tall enough to reach the top. But for now it works. 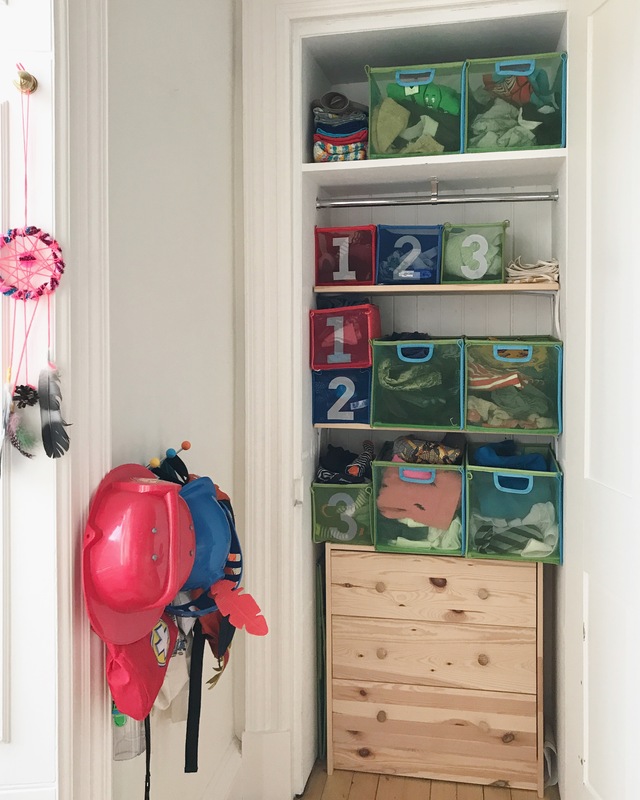 With a sleeping space and clothes storage taken care of, the last thing to sort was their books and toys. Oh so many books and toys! 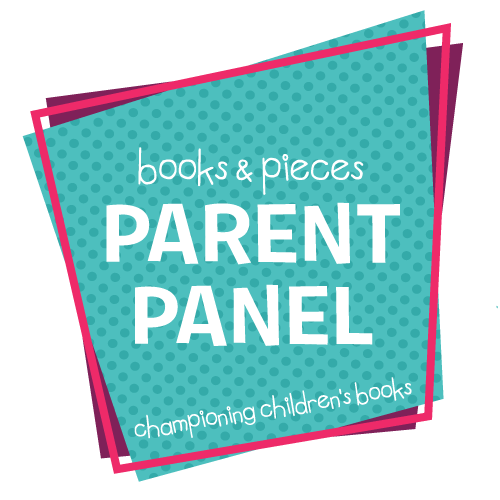 We knew from their last room, that the half sized bookshelf we had had was not big enough to hold all their books, so we went for a full size one. 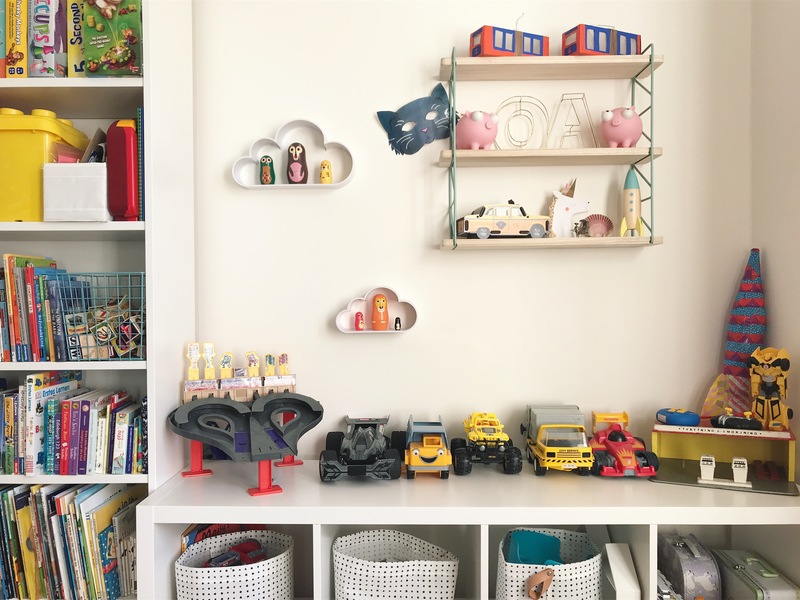 We paired this with a big sturdy shelf for their toys, and together they fit perfectly along the one remaining wall. 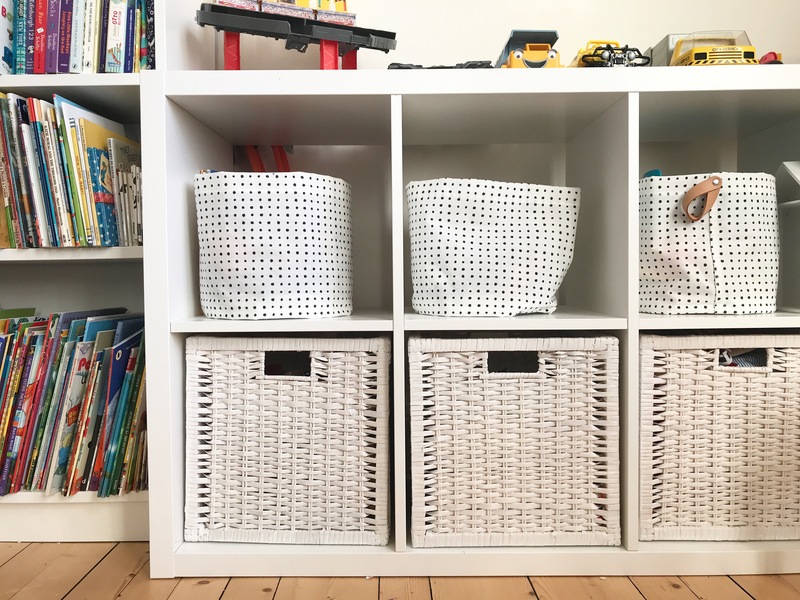 I fitted it out with a mixture of big, wicker baskets on the bottom for larger items like their train tracks or their Playmobil collection, and smaller linen baskets on the top row for things like their Matchbox cars or their collection of plastic animals. The top of the shelf unit is where they display all their large cars. 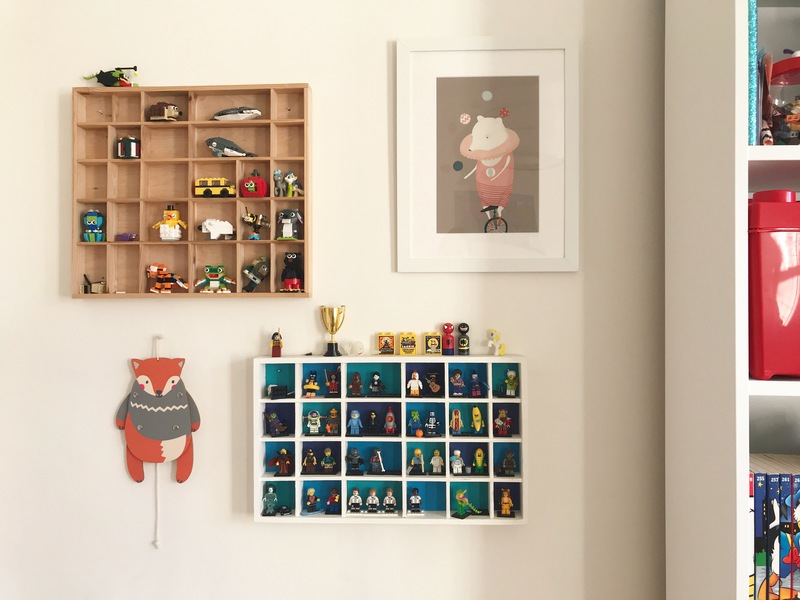 We also have some display units on the wall, for their Lego mini figs collection, and a smaller shelf for their piggy banks and some keepsakes that don’t get played with. 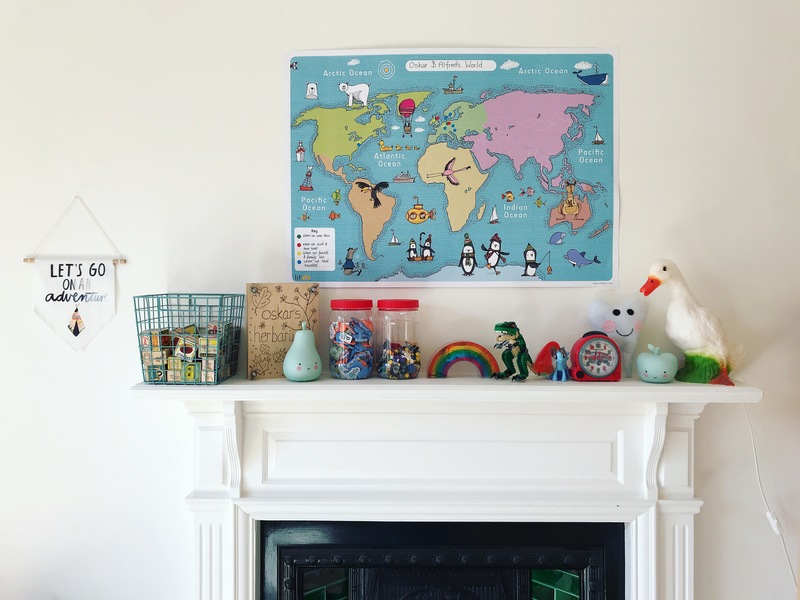 The top of the mantlepiece acts as another shelf, e.g. for Oskar to keep Lego models away from the destructive hands of his younger brother! The Lego Duplo has it’s own box, as it takes up so much space – the box has wheels so we can roll it over to the carpet to play with. 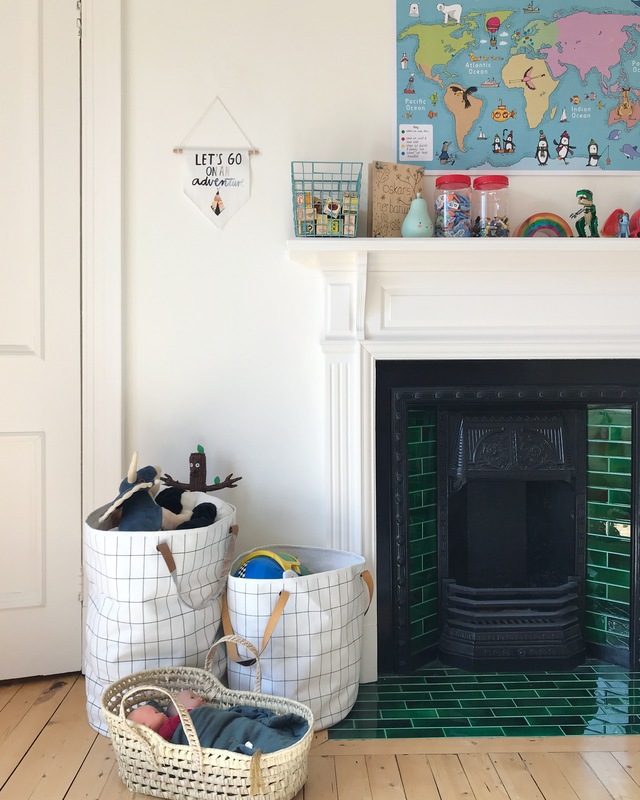 We did take the two monochrome rugs with us from Berlin, as well as the linen toy storage baskets which hold their collection of soft toys and puppets, and sit perfectly next to the fireplace alongside the basket for Betty and Henry, their two baby dolls. The last thing to find a home for, was their grocery store, which we put in the window. Since it doesn’t block out much light, this seemed both like the best place for it and the best use of the window space. As a finishing touch, I added a little ‘book nook’ to the unused space at the end of their bed, with some sheepskin rugs, a pile of cushions, and a reading lamp. 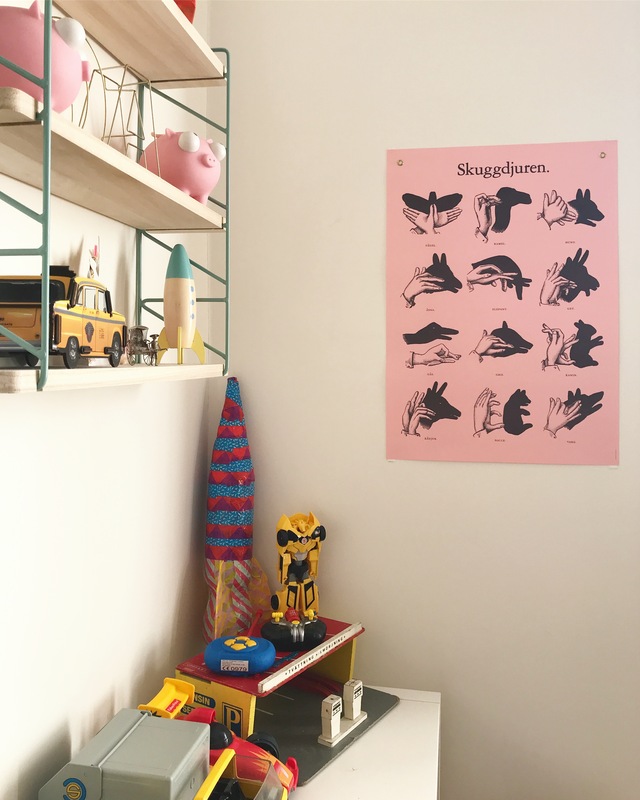 Decor wise, I like to keep colours neutral in kids rooms. 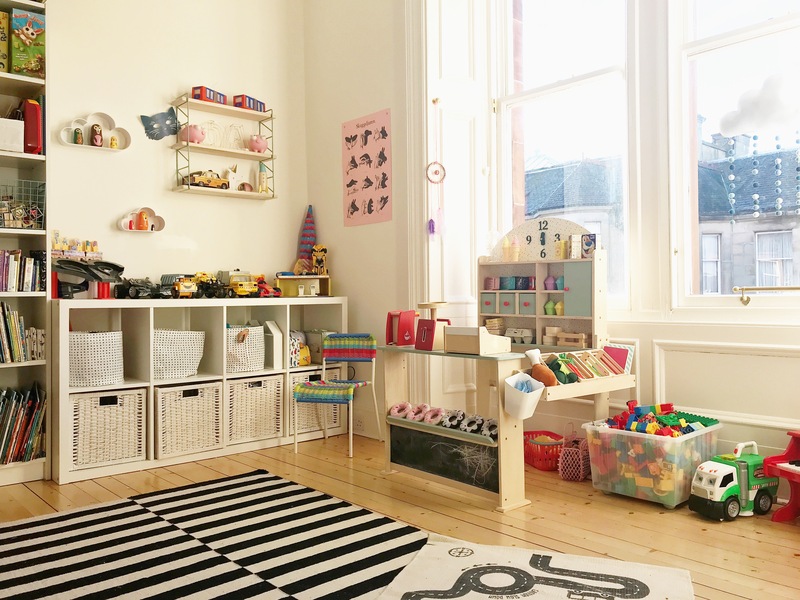 White or natural wood furniture and storage baskets, monochrome rugs, I feel the toys add enough colour as it is, and that way nothing clashes and there’s no sensory overload of colours. Another way to inject a little bit of colour in to the room is through bedding. 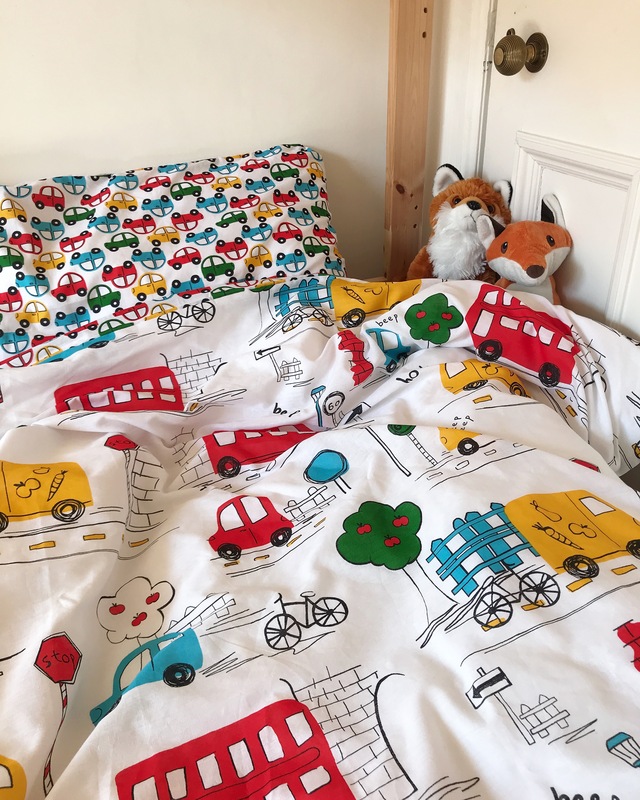 If it were up to them, they would have bedding with their favourite character from a certain Disney movie all about cars splashed across it, but I found the thought of that just too much. I don’t mind them having e.g. character T-shirts, but I felt it would just dominate the room too much having it as bedding. 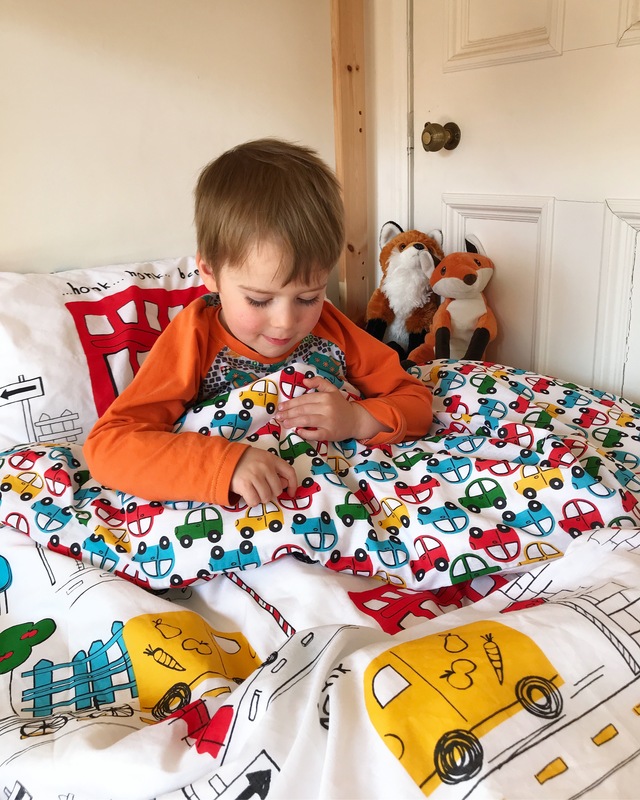 So when I looked through the duvet sets on the Room to Grow website, I knew immediately which set the boys would love most – a fun car pattern on a fresh white background, that would satisfy their car obsession but wasn’t too garish for mummy’s tastes. It’s reversible too, so you can add some variation to the room by switching it around. Just look at their happy little faces! 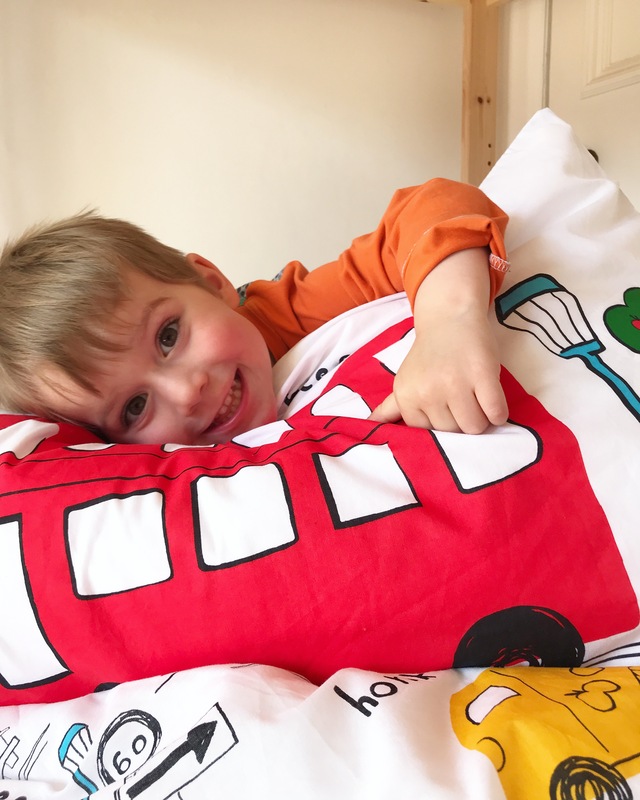 I hope you’ve enjoyed this little tour of the boys’ room, and many thanks to Room to Grow for inviting us review their lovely duvet set. 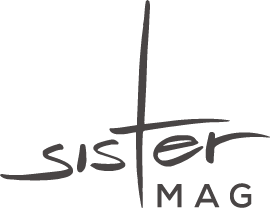 If you’d like to check it out for yourself, it’s available to order over on the Room to Grow website. I’ll also pop the sources below for some of the other things in the room that I often get asked about. Let me know if you have any questions, and have a great weekend! 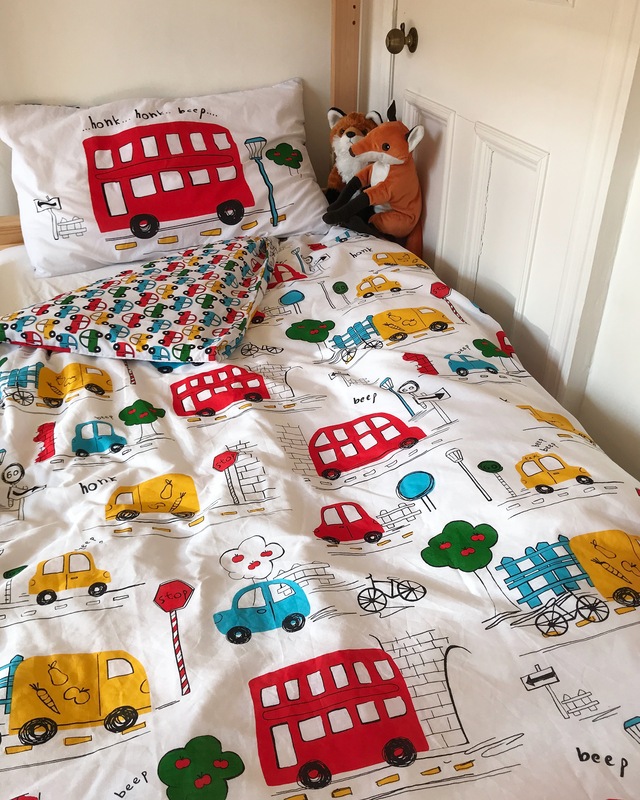 My son would adore that car cover for his bed! The room looks stunning! I wish mine looked as organised. What a cute boys room, I’m sure they love it. Nice inspiration to do one day similar. Ah, that’s a wonderful bedroom. Although they have one room less to spread themselves over that seems really big and more than adequate for all their books and things. Love the bedding and I was very intrigued by the handle on the window – very unusual! Oh this room is just absolutely beautiful, I love it. Such a fab room, so colourful but not too in your face! 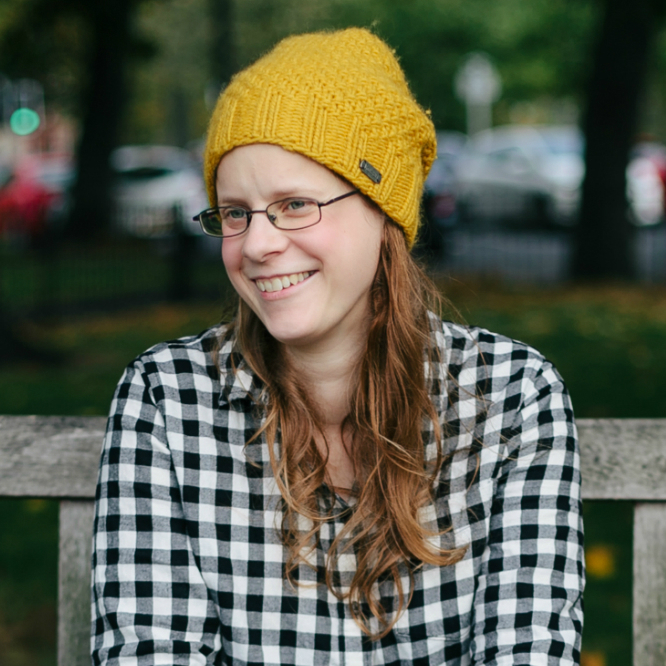 I’m such a fan of the duvets and those storage baskets, the checked ones – I’ve been desperately searching for similar ones for ages!